It seems well made and is holding up well to intense Florida sun on our deck. I would give the table five stars but the chairs would be a bit more comfortable if they had arms. 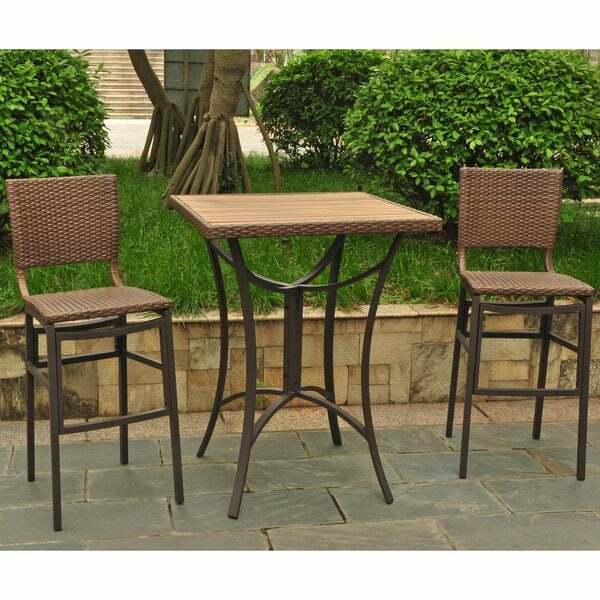 This wicker aluminum frame bar set proves that outdoor furniture does not require a style sacrifice. This weather- and UV-resistant seating set's aluminum wicker material provides the classy look of fine wood but resists water and weathering during all four seasons. Create a casual and friendly environment on your patio or poolside with this weather- and UV-resistant seating set. This set is very nice and good quality. It came wrapped, and wrapped and wrapped and took longer to unwrap the pieces then it did to assemble it! Recommend just hand tighting the table legs and then tighten everything when fully assembled to align properly. Good buy. I wanted a bar height bistro table for my deck, and this was just right. It was pretty easy for one person to assemble, lightweight enough to carry, but decidedly sturdy. It seems to be holding up nicely even with being exposed to wet weather, and it looks great. 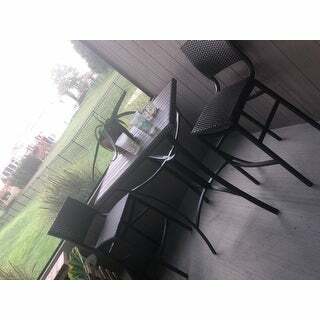 We went with the Antique Black color to match our other deck furniture. It's not so much a true black as a dark charcoal, but it looks very nice. The resin wicker has slight variations in tone, making it look more natural. We just received our set yesterday and assembled it last night. Came in 2 boxes, and they were surprisingly light. (I didn't realize the frame was aluminum, but that's a real plus, since the set is not difficult to move around.). I am very impressed at the quality of the manufacturing. The connecting bars are all welded, the powder coating is perfect, and the weave on the chairs and around the table edge is beautiful. I was a little concerned about the table top surface when I first ordered, bc the real expensive sets usually have a nice glass top. But the resin surface of this table top looks like wood, and is straight and smooth and even. I couldn't be happier with this purchase. Great value. Let's just hope I'm as happy in a year as I am today! Haha. I live in a small apartment, and this set was perfect for the space. A little outdoors brought indoors. I bought the near-black set. It arrived packaged well with ample shrink wrap on the items. Chairs were easy to assemble. I would've liked some written directions for the table--my spatial abilities are remarkably poor--and four diagrams could've been better understood if words accompanied the drawings. It took me longer than most shoppers here to put the table together, but I eventually completed it unaided. There was one small defect in the surface of the table, but I'm not sure if I didn't put it there when I was bumbling through assembly. Looks great, feels like quality materials. I'd buy again. I added two more chairs to the chocolate table and chairs I had just purchased. Nice high top got patio, Chocolate set is a very dark chocolate ! Very easy to assemble. Attractive and stylish outdoor furniture for my balcony overlooking the ocean. No disappointments here! Great height, comfortable and attractive. Easy to assemble- just follow the directions. Beautiful warm color looks great on my patio. This set was easy to assemble and arrived well packed. It is lightweight, so I would not put it out on an open deck or patio but it will work great on my screened in porch. The finish was a little uneven on the metal legs - otherwise, it looks nice. Table and chairs are nice, well made and comfortable. However, there is no leveling device on legs and table wobbles. Haven't figured out how to fix that yet. 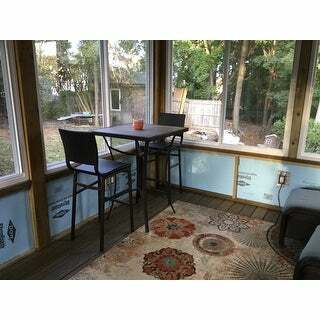 I am using it inside on tile floors and legs of item needed cushions to eliminate noise. No scratching of floors without cushions. Additionally, pieces are lightweight. It is easy to move but as other reviewers noted could blow down in wind gusts outside. I got he darker color. Finish on metal is good and pieces came well wrapped. Assembly was easy. Have gotten compliments on the set. Excellent quality and love the height. Very durable. Comfortable seating. Easy to clean the table. Fits great on the spot in our new sunroom. I have 2 of these sets....the first one is 2 years old...I keep one inside and one outside....durable, comfortable and attractive What more could you want? Stylish and comfortable. The table size is perfect for a balcony allowing sufficient size for dinner plates and wine glasses. (I had another table that was slightly narrower that was not). Chairs are comfortable; however, some purchasers may want to buy cushons. "Do the chair seats push under the table so that the back is flush with the edge of the table?" No, due to the crossbar. "it seems odd that this great bistro table and 4 bar stools sells for $719.99 but you can buy the table and 2 bar stools for $446.49 and then order a set of 2 additional bar stools for it and the total cost is $688.00 Shouldn't the bargain be with the complete set? Am I missing something? Also are there cushions that can be ordered for the bar stools?" "Can extra chairs be ordered?" Hello sandy2355, no these chairs do not stack. Please let us know if you have any further questions. "what is the weight rating for the chair?" Thank you for your question, jvogel. Overstock does not weight test items. Have a great day. Thank you for contacting us jkukovica. The height of the seat from the ground to the seat is 30 inches. Please let us know if you have any further questions.